It’s finally spring and time to pull back the cover on your pool. But don’t jump in just yet! Over the winter season, rain, snow and leaves have gotten into the pool and the water pH is probably not ready to welcome bodies just yet. While just getting the cover off may be a lot of work, there’s much more to do, but fear not. A Better Pool Service is here to help with these tips to get your pool ready. Whether mesh or solid, a pool safety cover accomplishes the task of keeping leaves, runoff and other items out of your pool. It also keeps the area safe so that family pets, children and wild animals don’t fall into the pool and drown. So it stands to reason that the pool cover needs to be cleaned, removed, set out to dry, and properly stored until it’s time to pull it out again. You’ll want to use a submersible pump or another kind of siphon to remove the collected rainwater and melted snow from the pool cover to keep it from falling into the pool. Once that’s done, grab a buddy and remove the cover from the pool. Don’t worry about some debris falling into the pool during the removal process, as you’ll be doing more cleaning in a bit. An easy way to remove the pool cover is to for you and your buddy to fold it accordion-style from one end of the pool. Then take it to your driveway and unfold it, hose it down and then allow it to dry. Throw talcum powder on it (to keep mold and mildew away), and loosely roll the pool cover to store it. To make it easier to install the cover in the fall, fold it accordion-style again, placing talcum powder between the folds to stave off mildew. If the water level is low, use a hose to fill it back up. The level should be near the middle of the skimmer or a little up the tile. If you’re a new pool owner, chances are you won’t have to worry about this part until later in the fall, but getting your pool ready for winter typically means disconnecting your pool’s filter, pump, heater and other pool equipment. Now, you’ll want to reconnect all of this pool equipment and make sure it still is in working condition. Remove winter plugs (they help keep lines from freezing) from the heater, pump, filter, booster, cleaner, skimmer, chlorinator, return lines and anything else that has a drain plug on it. Replace the regular drain plugs. Throw cracked and/or dry-rotted plugs away and keep all your winter plugs together in one big zip-seal baggie. Store near cover for later. Turn on the equipment, including the pump and filtration system. If your filter has an air relief valve, open it to let air out of the system. Now is a good time to do a walk-through and inspect your pool and perform preventative maintenance. Look for any electrical hazards like exposed wires and broken connectors, and make sure there is proper grounding. Check for pressure leaks in pipes. Lubricate O-rings in your pump. Correct any issues immediately. 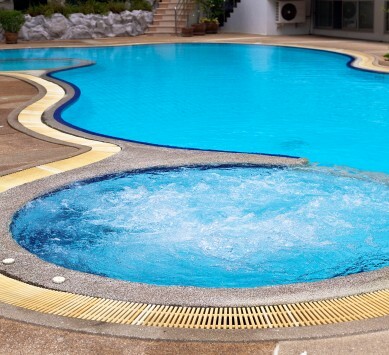 Check around the pool for slip hazards and cosmetic issues, such as missing or broken tiles. Install pool handrails or other pool accessories. Call the pool experts at A Better Pool Service for your annual maintenance! Grab the brush and long pole and get to scrubbing the walls of the pool. Vacuum, skim and brush the pool, and scoop debris up from the pool floor. If your pool has a lot of debris or algae, bypass the filtration process and vacuum dirt and debris direction out of the backwash line. If your filter has a multiport valve, this is an easy step. If not, it might be harder to vacuum to waste. Cut the pipe from the pump and reconnect once you’ve finished brushing the pool thoroughly. Once you’ve connected everything and allowed a few hours to elapse while the water gets circulated again, you’ll want to test the water’s pH, total alkalinity and chlorine levels. To do this, you’ll want to grab a few test kits from your local pool supply store. Buy more than one because it’s a good idea to test your pool’s water at least once a week during months of high use. For pool water to be ideal, the levels for pH need to be between 7.4 and 7.6, total alkalinity should be between 80 and 120 parts per million (ppm), and chlorine should be at a low 2 to 4 ppm. Once you’ve tested your pool and recorded its levels, adjust the chemistry. Begin with total alkalinity. Adjusting total alkalinity first makes it easier to adjust pH and chlorine levels. If it’s too high, you’ll want to lower alkalinity with bisulfite or muriatic acid. Follow the directions on the product and add only as much as you need. Wait 6 hours before re-testing. If total alkalinity is too low, simply add baking soda to the pool to raise it. Baking soda is sodium bicarbonate. For a pool, you’ll need more than the small container you’d find in your refrigerator. Buy a few big five-pound containers of the product, and only add a pound for every 10,000 gallons at a time. Wait at least 5 hours before testing again. Once total alkalinity is within range, your pH level should test in the normal range as well. If not, add muriatic acid in small amounts, testing between applications. Lastly, you’ll want to shock your pool to free chlorine, eliminate bacteria and ward off algae blooms. Follow the directions on the shock product to make sure you don’t use too much. Wait a few hours and test your pool. If all your levels are within range, have a test swim! You’ve certainly earned it!